Q. What am I supposed to use to sign in for home access to online resources? I'm being asked to sign in to access online resources from outside the library. What am I supposed to use? 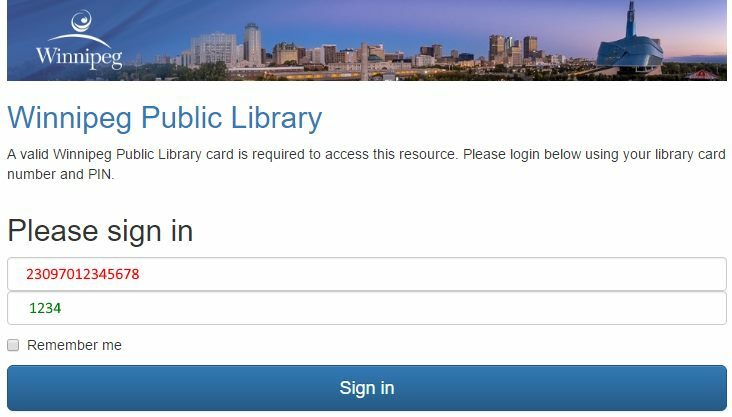 You'll need to use all 14 digits of your Winnipeg Public Library membership card and your 4 digit PIN. Your PIN is usually the last 4 digits of what we have on record as your home telephone number. So if your card number is 23097012345678 and your phone number is (204) 555-1234, you would enter 23097012345678 and 1234.